Above: Leica HD GEOVID 10x 42 binocular, note laser window at front of bridge (69,525 bytes). Click on image to see enlarged view (161,781 bytes). Leica binoculars have traditionally set the standards of brilliance, sharpness and brightness when it comes to meeting the objectives of turning observations that are rich in details into an unforgettable experience, even at great distances. In 1992 Leica took the leap of imagination by adding a battery powered laser ranging mechanism to a binocular engineered to provide highly accurate measurements of distance from the binocular to any target (within range) selected by the observer - the result was the GEOVID 7x 42 BD. As with the GEOVID BRF series models introduced in 2004, the original 7x 42 BD were sold in two configurations with a digital readout in either yards or meters. When the first GEOVID 7x 42 BD units arrived we at Company Seven were impressed by it, although as bulky as these were we were not sure these would be carried about too casually. But when a local scientist from NASA Goddard Space Flight Center tested a GEOVID from Company Seven for applications measuring lava flows from volcanoes, that was when we were truly impressed at the utility and durability of the device as well as its precision. As each successive generation of GEOVID have been released they continue to be the most highly recommended range finding binocular by most experienced guides - the laser ranging standard since 1992. Since 1992 Leica has succeeded in not only setting but also revising the the standard of excellence with their introduction of the GEOVID BRF binocular in 2004. The most recent generations of the Leica GEOVID binocular product line features a new seven element optics arrangement that dramatically improves the ergonomics resulting in a lighter weight more compact profile. In January of 2009 the current HD GEOVID BRF were released and while externally appearing identical to the original BRF models, the HD incorporate several refinements including increased laser range distance rating from 1,190 meters (1,300 yards) out to 1,280 meters (1,400 yards), and further refinements of the optics and lens coatings. Leica were the first who implemented laser measurement into binoculars, so they have much knowledge and experience about these issues. Without doubt, the GEOVID are the first and best high performance binoculars incorporating eye safe high precision targeting laser ranging. WHAT'S THE BIG DEAL ABOUT THE HD GEOVID BRF? Simply put this is a first rate optical system that incorporates a high precision laser ranging system too. So one can not only enjoy breathtaking views of a bird or other object of study (yes, even lava flows) but then determine the distance to that object. To measure the distance to an object, you must lock onto it precisely. To learn this you might wish to start off by tripod mounting your GEOVID BRF though it is designed to operate hand held too. Right: Leica GEOVID 42mm BRF attached onto our optional Leica Tripod Adapter (42,252 bytes). Click on image to see enlarged view (126,530 bytes). 1. activate the target centering mark by pressing the release button at the top of the left barrel once, this displays a small illuminated cube superimposed over the center of the field of view. Once the button is released, the target mark remains illuminated for around another 4 seconds. If the button is held down, the target marker is illuminated continuously. 2. point the binocular so that the cube is directly centered onto the object of interest, the system projects and returns a beam invisible (and safe) to the human eye. While it is illuminated, lock onto the object and carry out the distance metering by pressing the release button again. 3. the measured distance will be displayed clearly below the targeting cube - too easy! The target mark disappears briefly during metering. You can start a new measurement at any time by pressing the release button again, as long as the target mark is illuminated. 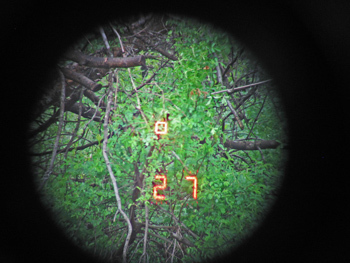 If the object distance is less than 10 meters / yards or if the range is exceeded or the object does not reflect sufficient light, the display shows "- --". When the display goes out, the distance meter is automatically deactivated. 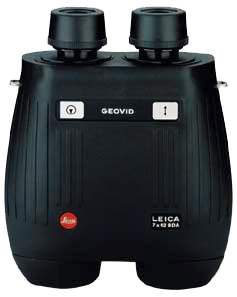 The Leica Geovid BRF binocular can also be used for continuous metering. If you hold down the release button after the second press, after approx. 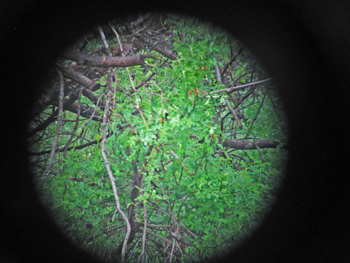 0.5 second the binocular will switch to the scan mode and then perform constant metering. This can be identified by the changing display: a new measured value is output approximately every 1.5 second. Scan mode is particularly practical when metering small targets, but this consumes far more battery life due to the constant activity. The GEOVID models have always been available with the readout indicating either yards or meters; we wish this latest generation allowed the user to simply switch back an forth but it does not. To avoid confusion the top of the GEOVID BRF focus knob is engraved with the rated maximum operating distance and with either "YDS" or "M" indicating yards or meters. Above: views through Geovid with range finder off (left), and with range finder on and centered onto target and displaying distance to target in meters. Note this is an afocal image taken with a pocket digital camera. When viewed with the naked eye the field of view appears wider and the edge shows a distinct sharp black border. While the exterior of the ULTRAVID HD were unchanged, and the basic specifications (magnification, field of view, etc.) similarly remained the same, improvements of the HD GEOVID address the focusing mechanism, the optics designs were refined, and then the exterior optics are treated with advanced contrast and resistance coatings to repel water and dirt; the new AquaDuraTM process. These line represent Leica's best possible optical performance, coupled with a lightweight yet rugged body design with improved ergonomics. Easy to Use: Better, Faster and Lighter: Logically tailored to the intended use, every technical and ergonomic detail that went into the development of the GEOVID BRF has been painstakingly examined, perfected or completely reinvented. The GEOVID BRF simply put "feels good in the hands". Its ergonomics provide an instrument that is an extension of the observer - it "gets out of the observer's way" with a very comfortable, natural and well balanced feel. The controls and hardware are placed at a convenient and comfortable position - and it's obstructions (strap hinges, etc.) remain out of the way. It also features a comfortable and unobtrusive thumb rest flat ares on the underside of each barrel. The HD models are covered with a new soft touch durable cladding. This material is more comfortable to grip in all kinds of weather conditions than those of prior generations. And the material is lighter in weight than the PVC covering used in the previous generation GEOVID BRF and the prior 42mm Trinovid BN models. The eyepiece design provides improved eye relief thereby making the observing experience more comfortable whether observing with the naked eye, with sunglasses, shooting glasses, or prescription spectacles. This also makes it easier and quicker for the observer to center onto a distant object. Twist up rubber covered eye cups design allows the user to quickly and conveniently snap the eye cup in our out. Unlike some other twist up designs, there is no peaked contour of the rubber cup so that the GEOVID BRF eye cup can be used while in or out, or in between their extension range without the observing bumping into the peak of the contour of other eye cups. These rubber covered eyecups can be removed by the user to facilitate cleaning the eye lens of the binocular, or replacement. The HD GEOVID BRF focus gearing provides smooth focus for a lifetime of service, with rapid focus from infinity to near focus points with slightly more than one full revolution of the convenient focus knob. This process can require as many as three revolutions in some competing models! Focusing the HD GEOVID BRF is even smoother and more precise than ever before as the mechanism remains free of play across the entire range. Optimized material pairings and gliding discs made from extremely tough, high-performance plastic are used. Left: Leica internal focusing mechanism. 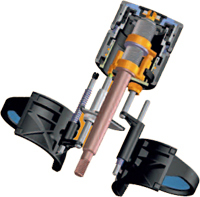 Rotating the focus collar drives a focusing lens element in each optical barrel (34,591 bytes). Click on image to see enlarged view (65,030 bytes). In cold conditions, the conventional greased focusing mechanisms sometimes only work with difficulty, and at higher temperatures they move too freely. Furthermore, these focusing mechanisms can feel "sticky", and at higher temperatures there is even the danger that grease can off gas or escape and run on the lens. With the optimized Leica focus, these risks have been eliminated. The new mechanics of the Leica HD models work practically without any lubricants. So even in extreme temperatures it is always fully functional Ð with a constantly optimal degree of smoothness. The diopter adjustment of the HD GEOVID BRF is accomplished quickly by a turn adjustment of the diopter focus mechanism on each eyepiece barrel. The HD GEOVID BRF is made of high grade lightweight structural materials including a housing made of aluminum. That of the GEOVID BRF is a more rigid design than what is usually required for a binocular, this is to insure better laser bore sighting. Brighter: This development is achieved by Leica's continued application of state of the art computer aided optical design, and by the use of special high grade optical raw glass materials. With the help of recently developed fluoride (FL) glass the Leica HD binoculars and APO spotting telescope models offer supreme color fidelity and contrast. Optical FL lenses are to a large part made up of calcium fluoride, a mineral with a crystalline structure. Unlike conventional optical lenses, this creates a very low level of dispersion (light scattering) and corrects aberration (imaging errors) significantly better than previous glasses. So as a result the viewing experience is more natural and three-dimensional, more impressive than it has ever been before. The optics incorporate the new HighLux System (HLS), this is an optical coating that is unequalled in its quantity and uniformity of transmission of light in the visible spectrum. The HLS coatings consist of a precisely applied forty three (43) layer coating, with each layer applied as thin as only 40 nanometers. By means of a special mirror layer on the prism system the process yields a level reflection of 99.5 %; it was possible to raise the image brightness to this level over the prior generation models. This among those attributes that makes the impressively high resolution imaging performance, and striking enhanced contrast possible. It is a cold morning and the lens fogs up - that is not much fun. Fingerprints, dust and rain are also annoying when viewing. The innovative Leica AquaDuraTM coating considerably reduces these disturbing factors. Imitating nature as with the lotus plant, this new water and dirt-resistant protective layer on the outer glass surfaces ensures that dirt and moisture are barely able to take hold on the specially adapted surface structure of the optic. This is the same coating applied by Leica for their latest APO-TELEVID spotting telescopes that come available in 2009. Right: Microscopic image of water droplet demonstrating the operating principle of AquaDura (32,870 bytes). Click on image to see enlarged view (47,295 bytes). On the previous generations of anti-reflection coating the water tended to bead on the optical surface, this is particularly distracting on the eyepiece lenses being closer to focus. But with Leica AquaDuraTM the water droplets do not adhere, and the surface is also resistant to the formation of fog that would otherwise reduce contrast if not completely obscure the object of the observation. 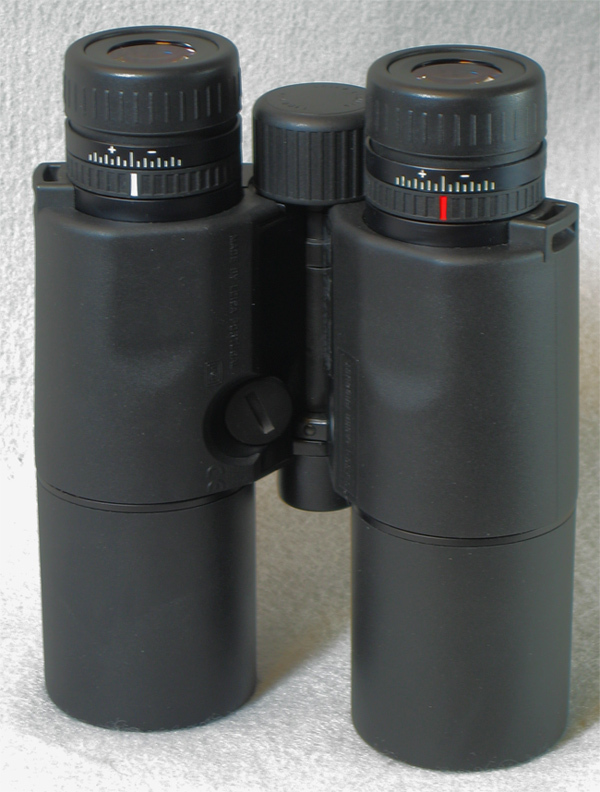 Left: Leica AquaDura applied on the right objective lens of a Leica binocular. Compare this with previous generation high transmission coatings applied on the left objective (82,183 bytes). Click on image to see enlarged view (142,864 bytes). reduced cleaning efforts required leaves you more time for viewing! Stronger: As if the Leica durability was not already good enough, Leica takes this too to another level of endurance. The housing of the HD GEOVID BRF is made of a diecast all metal aluminum chassis. This provides light weight and great strength compared to aluminum. And the GEOVID BRF frame has nearly twice the thickness and strength of any competing metal alloy or composite binocular made today. The critical oversized Center Axis Shaft is made of extremely rigid and durable alloy. This is highly resistant to wear, contributes to structural integrity, and is a critical aspect of maintaining precise alignment of the binocular over a lifetime of service. The critical parts of the focusing system of the HD GEOVID BRF utilizes a precisely machined helicoid gearing mechanism that is smoother, more durable, and more costly choice than the spur gear drive and materials employed by many competitors. The HD GEOVID BRF are highly shock resistant, nitrogen purged to be fogproof, waterproof to a depth of 5 meters (16.5 feet), and will function over an extremely broad range of temperatures of from -25 degrees C (-13 degrees F) up beyond where most humans can endure. The HD GEOVID BRF42mm models are available in magnifications of 8x or 10x, the "BR" suffix indicating they are each clad a black soft armor covering. The 42mm aperture HD GEOVID BRF series provide a great balance of resolving power, and portability. And ready for most daylight, early morning and dusk light conditions. These models achieve an image brightness that was impossible before now in a 40 to 42mm roof prism binocular. And their images will appear brighter even when compared against other less sophisticated models even with larger aperture objective (front) lenses. People who require even greater detail recognition in adverse lighting conditions should consider the larger HD GEOVID 56mm BRF models. 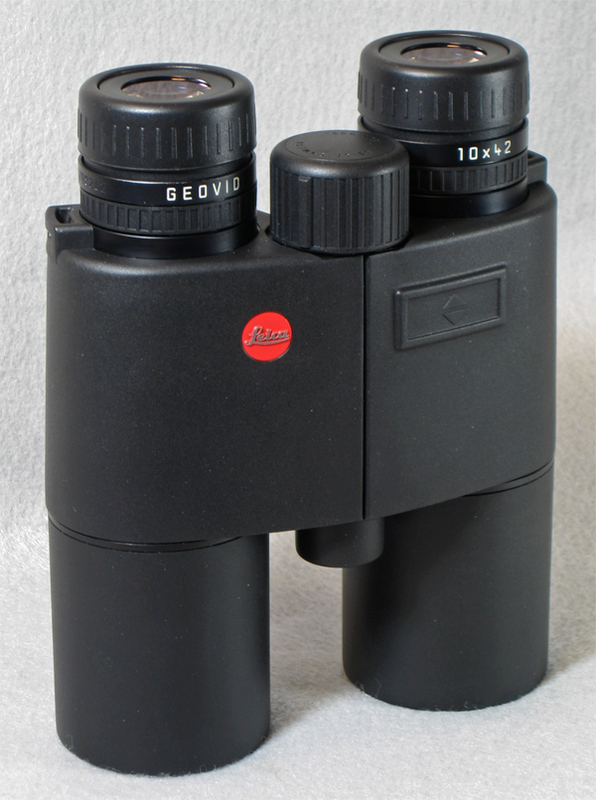 Right: Leica GEOVID 10x 42 BRF laser range finding binocular (56,969 bytes). 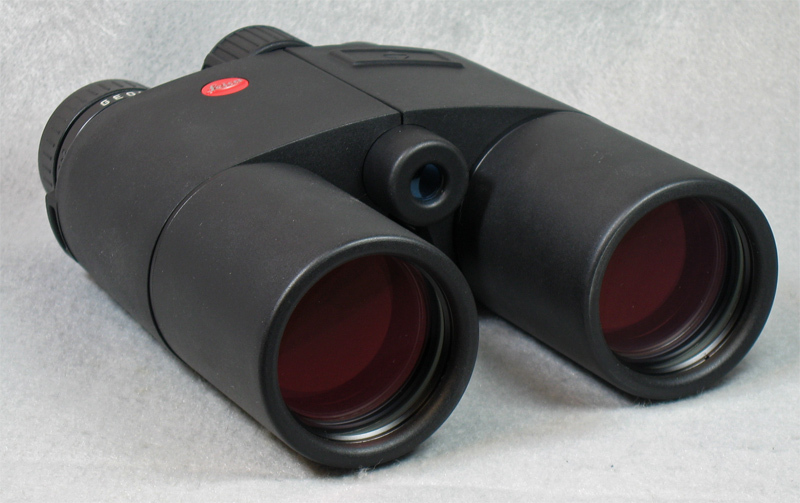 The remarkably slim and compact housings of the GEOVID 42mm BRF assure these binoculars can easily be put into a large coat pocket, into a brief case or travel bag, making these a very handy binocular to travel with - having a binocular available is just as important as its optical properties. To make it even easier to carry and deploy Company Seven offers an optional "holster" custom fitted to hold this binocular. This is made of heavy duty leather, finished in black. It is similar in quality and construction to conventional heavy duty leather pistol holsters. This accessory can be attached onto a belt and it incorporates a leather strap to keep the binocular in place. 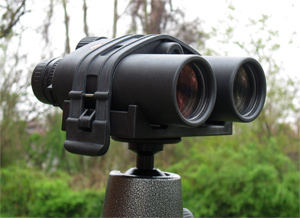 The holster protects the objective (front) lenses of the binocular, and we include a smaller leather strap to attach the furnished binocular rain guard onto the binocular to protect the eyepieces. The holster provides excellent protection, and ready access to the binocular while hiking or climbing. Furthermore, one no longer needs to carry the binocular with the strap, it now becomes a quick and simple matter to "draw" the binocular and share it with others without the nuisance of having to clear a dangling strap over your jacket hood, hat or sunglass straps. The multi-talented binocular that delivers images with rich contrast for observation in daylight and at twilight. The ratio of brightness and weight and size, that extra magnification over the typical 7X binocular, and 6.3 degree actual field of view featured by this model make it optimal for a great many applications. 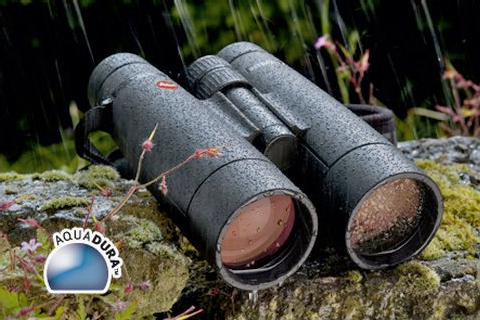 The binocular with the highest magnification in the line of GEOVID 42 mm binoculars. This becomes especially apparent with the improved image steadiness during observation at great distances. Note: each GEOVID sold by Company Seven is quality control tested by us to assure the highest consistency and nominal performance. And any unit sold by us will bear US and international warranties, and can be returned to us for cleaning or service as desired. ** Lithium battery recommended for best cold weather performance. *** In extreme cold keep the GEOVID warm (under your coat, etc.) to keep the battery voltage from dropping. "Leica GEOVID 8/10 x 42 BRF and Leica GEOVID 8/15 x 56 BRF". Ninety page illustrated instruction manual with specifications describing our Leica GEOVID BRF Range Finder Binoculars announced in 2004. Content is in German, English, French, Italian, and Spanish. Basic operations are similar to those of the current HD GEOVID BRF series. Publication content by Leica, all rights reserved. From Company Seven's Archives. 521,098 bytes (in Acrobat Reader ".pdf" format). "Leica Innovations: ULTRAVID HD Binoculars & New TELEVID Spotting Telescopes". Two page color illustrated pamphlet describing our Leica new series ULTRAVID HD binoculars and APO-TELEVID spotting telescopes announced in August 2007. 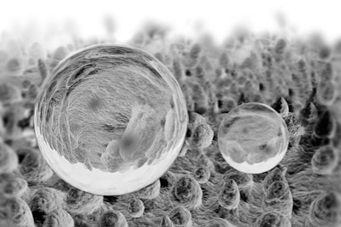 Focus is on the new FL Fluoride optics, the improved focus mechanism of the ULTRAVID HD, the Leica AquaDuraTM "hydrophobic" coatings technology. Publication content by Leica, all rights reserved. From Company Seven's Archives. 432,342 bytes (in Acrobat Reader ".pdf" format).